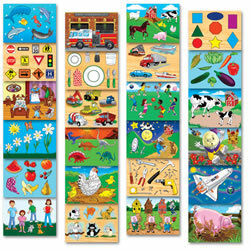 Kaplan's selection of wooden puzzles comes in a number of subjects to reinforce classroom concepts. Subjects include letters, numbers, colors, shapes, diversity, life skills, animals, geography, and more. 3 years & up. 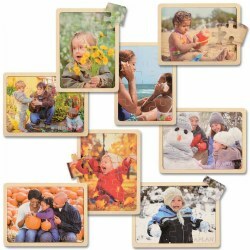 These 12 piece jigsaw puzzles are vivid, real-life images of children and families enjoying all the seasons. Features two puzzles for each of the four seasons. 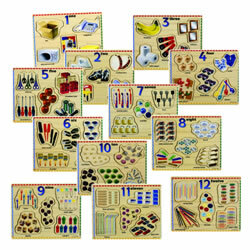 Each 12-piece puzzles measure 9"H x 12"W.
3 - 6 years. Real people with everyday jobs! 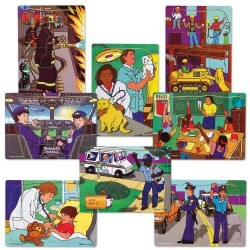 This set of twelve 9" x 12" puzzles come with a color inlay of the image with numbers on back of each piece to assist users in locating puzzle pieces. 10-15 pieces. 12 months & up. 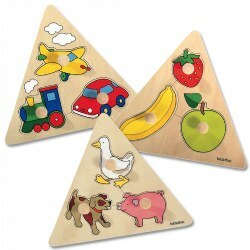 These wooden triangular puzzles feature large wooden knobs on each of the 3 pieces for easy grasping. Includes fruit, vehicle, and animal puzzles. Puzzles measure 10.25"L x 8.86"W each. 12 months & up. Extra large knobs make it easy for small hands to remove each brightly colored piece. Matching full color pictures are underneath. These super sized, solid wood puzzles with extra chunky 1/2" thick pieces are the perfect first puzzles. 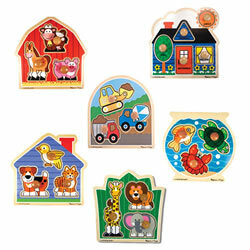 Set of 6 puzzles with themes that include: construction vehicles, shapes, safari, pets, farm, and sea life. 3 years & up. Learn about traffic and street safety signs in your community or city. Includes Stop, Yield, Exit, Hospital, Phone, Wheelchair, School crossing and more. Each piece is raised for easy access. 3 years & up. Help children learn to recognize the basic shapes by matching the objects to the right shapes on the board. Each 6" x 9" puzzle is self-checking with color pictures and raised surface for easy pick up. 3 years & up. 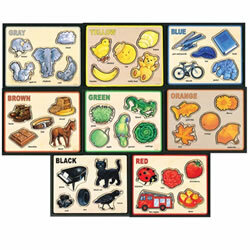 These puzzles help children recognize basic colors and words. 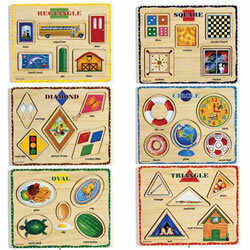 Wooden inlay puzzles have rounded corners, with easy to grip, lift-out pieces. Identifying words are printed next to each object. Each puzzle is 3/8" thick and measures 8 1/2" x 6 3/4". 3 years & up. Twenty-four classic puzzles complete with a rack for storage. 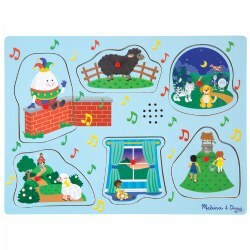 Each 9" x 12" wooden puzzle depicts a classroom theme, nursery rhyme or basic skill and contains 4 - 12 puzzle pieces. A must for every classroom! Rack measures 7" x 25" x 11 1/2". 2 years & up. 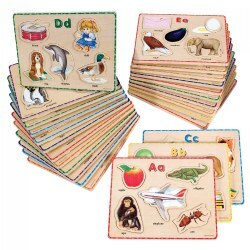 Each puzzle has 5 pieces labeled for identification and encouraging early reading skills. Large knobs make grasping easy for little hands. 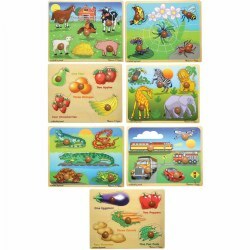 Set includes transportation, wild animals, insects, farm animals, reptiles, fruit and vegetables. Each puzzle measures 12" x 14" x 1/2" thick. 3 years & up. 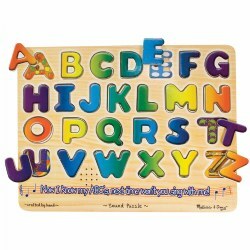 The upper case alphabet puzzle features whimsical patterns under each letter as well as light activated sensors that trigger songs and sounds--an engaging way to reinforce early learning concepts. Requires 3 AAA batteries (not included). 2 years & up. These hand painted, playfully styled puzzles are like nothing you've seen before! The thick, chunky wooden puzzle pieces fit neatly into their spots on the colorful board and also stand up for additional pretend play. Full color pictures beneath each piece. 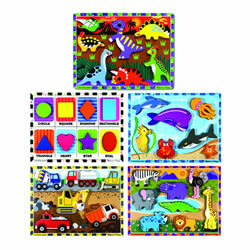 Set of 5 puzzles with themes that include: safari, dinosaur, sea life, shapes, and construction. 3 years & up. This friendly bear puzzle features 18 interchangeable pieces, including six adorable coordinated outfits and six varying expressions that can be mixed and matched for hours of fun! A solid-wooden box houses all wooden puzzle pieces making this ideal for travel, home or school. Measures 6" x 5" x 1.5". 3 years & up. 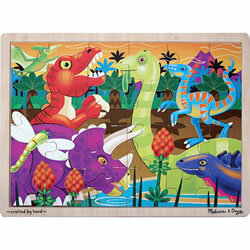 Dramatic dinosaurs are featured in the prehistoric landscape on this 24-piece wooden jigsaw puzzle. With a volcano in the background and a colorful collection of dinosaurs gathering at the waterhole, this puzzle will appeal to the imagination of any dino lover. Comes packaged in a sturdy, wooden tray for puzzle building and easy storage. 3 years & up. Learn numbers from 1-12 with individual puzzles for each number. Each puzzle is self-checking with pictures of the particular number of items. Raised surfaces make for easy pick up. Puzzles measure 8 1/2" x 6 3/4". 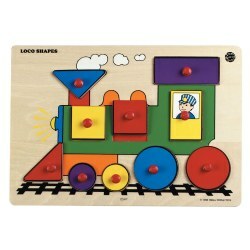 Loco Shapes Puzzle is the Level 2 puzzle that has children match the colorful shapes of the train engine. Features 10 removable pieces with small knobs. 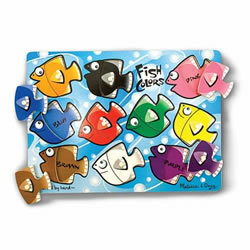 With this puzzle, children have to place the pieces with the matching color and shape of the puzzle board. 3 years & up. 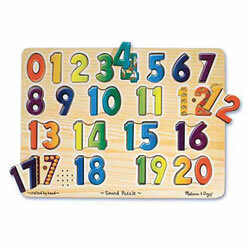 This 21-piece wooden sound puzzle pronounces the name of each number when its piece is placed correctly! Pieces are slightly raised above the puzzle board for easy grasping. Colorful pictures underneath each piece help teach counting and reinforce the relationship between quantities and numerals. This educational puzzle has lots of ways to learn and play! Requires 3 AAA batteries (not included). 2 years & up. Adorable pictures of common pets illustrate this wooden, 8-piece peg puzzle. 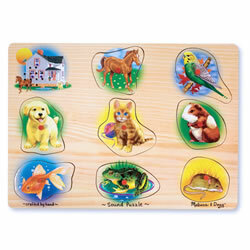 When each piece is placed correctly in the puzzle board, you hear the matching animal noise. Eight sounds in all. Full-color matching picture under each piece. Requires 2 AAA batteries (not included). 3 - 6 years. Horse and foal, pig and piglets, cat and kittens - see how animal families grow with these wooden puzzles! Individually cut and painted with bright, non-toxic colors. Each puzzle is 9" x 12" with 7 to 13 pieces. 3 years & up. 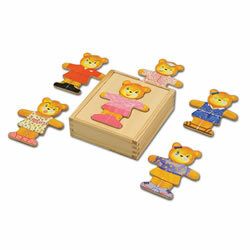 This wooden set contains 45 mix-and-match pieces to dress the bear family. Comes in wooden box for storage and puzzle building. 2 years & up. Each wooden puzzle piece has a full color picture underneath. Tell a story, play a guessing game, or find the hidden pictures. Mix them up to form your own creation. Easy to hold pegs allow children to develop fine motor skills. 12" x 9". 2 years & up. 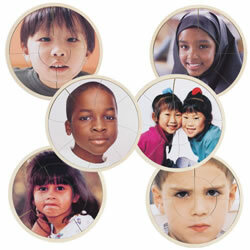 Reinforce cultural, gender and occupational awareness with colorful, positive images. 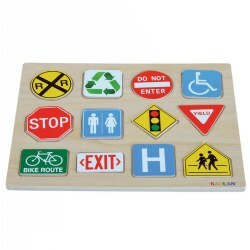 Sturdy non toxic wooden pieces will encourage a child's creativity while teaching manual dexterity. 9" x 12". Set of 8. 3 - 6 years. Learn about our neighbors from different cultures. Discuss what each of you have in common or celebrate the differences. Each puzzle is numbered on the back so you can locate the puzzle pieces for each puzzle. 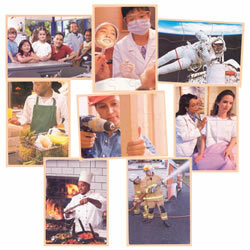 A color image is silk-screened inside the frame for an easy reference. 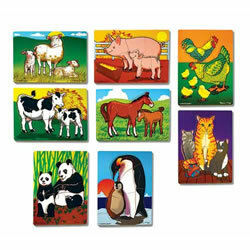 This beautiful set of 6 children's photo puzzles has between 7-12 pieces. 3 years & up. Simple picture matching paired with letter and word recognition promotes early reading skills and enhances a print-rich environment. Vowels are printed in red for easy identification. Includes a puzzle for each letter of the alphabet. Each puzzle measures 8 1/2" x 6 3/4".